A luxurious queen size mattress is just what you need for a perfect night’s sleep. And with Brosa, you’ll be able to invest in a mattress designed specifically for your sleeping habits. Do you prefer a firm sleeping base or the feeling of sleeping on clouds? We’ve got queen size mattresses for both preferences, as well as an in-between mattress that offers full body support in sleep. Designed to go perfectly with our range of queen size bed bases, our mattresses will deliver the utmost comfort for perfect sleeps year round. We take great pride in bringing you mattresses of superior quality all designed and made right here in Australia. 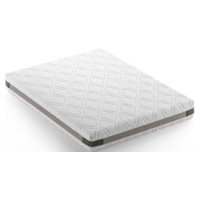 Just as with all Brosa’s products, our mattresses are made from the best adaptive foam materials, meaning you’ll get a better night’s sleep every night. If you don’t within 30 days, we’re happy to issue you a full refund and will even collect your mattress from your home. But if you fall in love, we’ll be here with a 10-year warranty to ensure you have the best night’s sleep for years to come. Browse our collection of queen size mattresses today to live the life of luxury with a quality mattress designed for you.